James "Baba" Battista refused to talk to the FBI. Out of prison, he's unloading in a new book. In 2007, when it was all fresh, David Stern called the Tim Donaghy referee betting scandal the "worst situation that I have ever experienced either as a fan of the NBA, a lawyer for the NBA or a commissioner of the NBA." Among the topics Stern discussed that day was whether the NBA could survive. Nearly four years later, it's over. Investigations have been concluded. The FBI has weighed in. Reports have been published. Conspirators have been convicted. Addictions (to gambling in one case, drugs in another) have been treated. Time has been served. Oversight has been tightened. Even the media chatter -- that maelstrom of oddsmakers, the FBI and the mob -- has slowed to a trickle. What's more, NBA TV ratings are through the roof, the audience is global and growing, a new owner-friendly collective bargaining agreement is in the works and All-Star Weekend is here. It's hard to remember, now, that a ruffian like Donaghy ever had a shot at bringing down the mighty NBA. And get ready for Round 2. "Gaming the Game," by Sean Patrick Griffin, is an exhaustively researched book threatening to overturn some comfortable assumptions about the NBA's referee scandal. Griffin has poured two years of frenetic interviews and document searches into one weighty volume. Thick with footnotes, appendices and source notes, it's no easy read. But it is certainly well-supported. The book's claims are buttressed by off-the-record talks with law enforcement (Griffin is a former cop); on-the-record insight from the vast trove of associated legal documents and betting data (Griffin teaches primary source research at Penn State); interviews with gamblers, lawyers and investigators; and -- most importantly by far -- unfettered access to James Battista, with whom Griffin is sharing book proceeds in exchange for his exclusive collaboration. The book delivers the intrigue you'd expect from a true crime thriller. There are government agents in a white van across the street. There are cell phones destroyed in a bath of acid, to cover all traces. There are tales of Donaghy suggesting other referees could help predict games. There are nicknames, rats, prostitutes, celebrities, bags of cash, bags of cocaine and more. There is also more information than ever. Battista's take matters, for a few reasons. For one, it's new. Of the conspirators, only Battista did not talk to the FBI or (with the exception of one HBO interview) the public. He's also the one best-positioned to know what was really happening. Battista asserts, and Griffin's dogged research supports, a version of events that is not nearly as tidy as the NBA and Donaghy would like you to believe. The key question: Whether or not Donaghy fixed NBA games. Donaghy's story is that he bet on all kinds of things for years with his buddy, including NBA games. He entered a conspiracy only when Battista and Thomas Martino, the go-between who spoke to Donaghy before games and delivered thousands of dollars when Donaghy's tips paid off, confronted him at the Philadelphia International Airport Marriott on Dec. 12, 2006. The idea of the mafia has hung around this Donaghy story from the start: The scandal was uncovered thanks to a wiretap of the Gambino crime family, and "Battista" and "Martino" are mafia names from central casting. However, the only person still claiming the mafia had anything to do with this is Donaghy himself. It wasn't so strange that they'd be relaxed together, and not just because of the drugs (for his part, Battista says he was on Percocet, OxyContin and cocaine at the time, and skipped the marijuana). Battista and Donaghy were not close, but the three in the car were hardly strangers. They had attended high school together at Cardinal O'Hara in the 1980s. In the months prior, Battista says he gave Martino valuable NFL picks for Donaghy to bet on. Battista says Donaghy thanked him with a signed Kobe Bryant jersey. By the time they were in the Honda, Battista had known for years, through gambling contacts, that Donaghy was betting on NBA games, including games he refereed. Battista also says he always knew Donaghy to be extremely greedy, and had been expecting Donaghy to come calling again, looking for something of value, whether it be NFL picks, cash or something else. "If the NBA gave out free tampons," says Battista, "Timmy would take them. That's the type of guy he was." Jack supposedly owed Timmy forty thousand dollars, but told Timmy he didn't have the money because he lost it down at the casinos in Atlantic City. I wasn't sure if this was why Timmy wanted to meet with me, but I thought so. At least I hoped that was why, because I knew what it would mean if I had an NBA ref on my side. I told him I'd bet the two thousand a game but I didn't want him dealing with Jack anymore even though Jack still owed him money. The less people who knew, the better. We set the deal up. Griffin shows that in the government's vast array of documents (a tangle of 5k1 letters, affidavits, rulings, etc.) surrounding the case, the government never suggests the mafia had anything to do with it. Griffin points out that prosecutors and law enforcement officials love to brag about putting mobsters behind bars, but in locking up Battista they did nothing of the sort; no government document even hints that Donaghy was anything other than, in their words, a "willing participant." By that point in the book, it makes sense that the government would not call Battista a mobster. Griffin spends more than 100 pages detailing Battista's career as a money mover. If you want to bet six figures on an NBA game and have a reputation for winning often, it's tricky to get sports books to take your bets. That's why the world's "sharp" gamblers -- identified here with pseudonyms like "Zorba," "The Machine," "Chinaman" and "the Englishman" -- employ movers to do the hard work of breaking the big bets into small ones, and placing them in others' names around the world. Battista flourished in that tricky role and developed an A-list of clients. He moved huge sums daily, for years, working around the clock. He says that at the height of the Donaghy scandal, he bet more than a million dollars per game on behalf of his clients. There are hints that the mob is involved in sports gambling -- for instance, in demanding protection money from bookies and movers. Members of the mob may well have been among the many who followed Battista's Donaghy bets. But it's evidently alien to the FBI, to Griffin's long list of sources, and to Battista's biography to suggest that Battista was any kind of mobster, or in a position to credibly threaten violence to Donaghy that night. Martino is quoted, from an FBI memo, underscoring that point: "Martino never heard Baba threaten Donaghy in any way. Martino had the impression that Donaghy wanted to provide the picks to Baba for Donaghy's own financial gain." Donaghy, meanwhile, is a black hole of credibility. 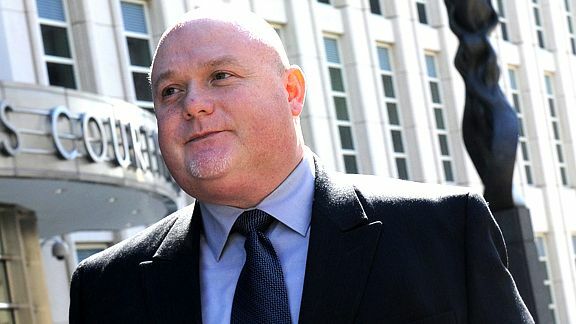 Griffin offers a quote from Battista's lawyer, Philadelphia-based Jack McMahon, that indicates McMahon relished the opportunity to savage Donaghy's reputation at trial. McMahon had evidence that Donaghy had cheated on tests in high school and college; there were many stories of fights (with neighbors, golf partners, others), drug use, vile pranks involving urine, stink bombs and more. McMahon calculated that the government did not want Donaghy on the witness stand, and sure enough, shortly before Battista's trial was to start, government lawyers offered to drop the most serious charge in a successful play to keep Donaghy off the stand. Donaghy insists he did not fix games. It was a surprising position from the start. What gambling addict would have the power to win nearly all his bets, but not use it? From the outset of this story, I have never found anyone with direct knowledge of the scheme who supports Donaghy's version of events. To the extent that has been investigated, results have been inconclusive. The government did not dig deeply, and by its own admission left the question unanswered. The NBA's independent investigator found some causes for concern, but not enough to say with certainty he did fix games. Gambler Haralabos Voulgaris, meanwhile, has been saying since 2007 the same things Battista is saying now, and has even dug into the video record to produced clips that he says show Donaghy fixing games. Griffin does not put the issue to rest, and his evidence is scattered throughout 300-plus pages. But put it all together and the book tilts the conversation meaningfully, so that now a preponderance of the evidence suggests Donaghy did fix games -- an assertion that is entirely in step with what gambling insiders have been saying all along. Late in the book, in a footnote, Griffin makes something of a "game, set, match" observation. Donaghy told authorities, and Battista confirms, that Donaghy and Martino used a secret code to communicate picks over the phone. "If Donaghy mentioned Martino's brother Chuck (who lived in the Philadelphia area), the pick would be the home team," the U.S. attorney explained in a letter to the judge. "If, on the other hand, Donaghy mentioned Martino's brother Johnny (who did not live in the Philadelphia area), the pick would be the visiting team." That the three conspirators agree on this point is proof positive that the conspiracy was about games Donaghy reffed. Such a code would not work in a world where, as Donaghy alleges, the three were looking to exploit his leaguewide insight on a regular basis. This code assumes everyone knows which of the NBA's many games they're talking about. Battista also points out that Donaghy was religious about checking with Martino, before games he reffed, to find out the point spread Battista had been able to get. That's information that would be essential for a game-fixer, but a curio otherwise. Gamblers have said from the start that the true evidence of the scandal was in the betting lines. With deep-pocketed clients, Battista bet big. In the intimate and information-sensitive world of professional sports gambling -- where competitors share the same runners, informers, offshore sports books and betting lines -- Battista's hot streak on Donaghy games (by all accounts, the streak resulted in an unheard of 70 percent to 80 percent success rate) was quickly noted and mimicked. "Bookmakers knew something was going on," says Battista, in his book. "These were the most respected bookmakers in the world. They didn't cheat on the numbers, and they were very good at what they did. The lines were moving so much, and wasn't like there were injuries or anything else that could account for the big line moves." Griffin includes word of one unnamed gambler who reportedly made $200 million following Battista's Donaghy picks. Battista used guile to throw off the scent and set up the market to his advantage: He says he'd get the picks from Donaghy by the morning of the game. Then he'd bet tens of thousands against Donaghy's pick. Other bettors, eager to follow Battista, would bet the same way. As the day wore on, and the lines grew friendlier to Battista, he'd unleash far bigger bets, now on the right side of the pick, at the advantageous price. Even with the head fake, though, the smart money still drifted heavily to one side of the bets, forcing the sports books to move their lines to attract bettors to take the other side. In fact, Griffin explains that the conspiracy ended not when the FBI got involved, but instead when another conspirator, Peter Ruggieri, was brought in to place the bets while Battista was in drug rehab. Ruggieri found the massive line moves shocking and shut the whole operation down, fearing it was only a matter of time before the scam was exposed. Griffin does original research, using lines from three different sources, and finds that during the period of the conspiracy, 25 percent of NBA games had line moves bigger than 1.5 points. Despite Battista's "head fakes," 43 percent of Donaghy's games over the same period had those kinds of line moves. Meanwhile, Battista reports that now and again Donaghy provided a pick on a game he did not referee. In Donaghy's book, he describes at length how he won bets by knowing which referees hated Allen Iverson and the like. Battista says that Donaghy's insight into games he did not referee was no good -- which is in keeping with the evidence. As of today, all four conspirators -- Donaghy, Ruggieri, Martino and Battista -- have talked in some fashion or another. Ruggieri, Martino and Battista all agree that the only picks from Donaghy that mattered were picks on games he refereed. "Being able to control the outcomes," says Battista, "was the big reason he won his games. That was why he couldn't pick those other games." Of course, that leaves Donaghy alone with this theory, and credibility issues. "Gaming the Game" was necessary. The Donaghy conversation has long been a blank canvas onto which fans and pundits have projected their darkest theories about referees. It is now, helpfully, tethered to evidence. But even now that Battista has spilled the beans and Griffin has done the hard work of assembling the information, we're still in a dissatisfying place. The conspirators are all reportedly broke, or close to it. Yet any number of unpunished gamblers made untold millions by selling, essentially, the NBA's credibility. The FBI got involved in no small part to stop the flow of money to organized crime. But did they? Meanwhile, the NBA has Donaghy's call data in numbers and on video, for instance, and could come clean. (Why would they want to protect him?) The league's credibility hangs on the thin legalism -- put forth by Donaghy -- that Donaghy might not have fixed games. In the meantime, it's an open question: Can this book nudge us beyond our current state, where fans have to wonder if Donaghy marred, for instance, that 2007 Suns versus Spurs series? Or if he did something untoward that might have led to the nasty fight in Auburn Hills? Was Rasheed Wallace out of line in verbally assaulting Donaghy after that game, or was he right? If Griffin's book can nudge the NBA into helping us move beyond a phase of having to wonder, essentially, about the credibility of several years of recent NBA play, that will be a great thing indeed.